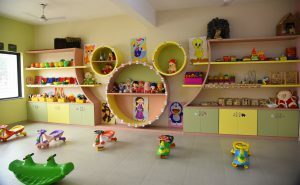 Along with the outdoor kids play area, there is a Toy Room indoors, since children cannot go out to pay during bad weather. A variety of indoor toys are provided along with some tricycles, indoor see saw, kitchen set. The toys are child-friendly and made from materials suited for the health. We have Lego, wooden, foam, soft toys, pattern toys, construction toys besides others which are popular among children. Copyright © 2019 Anekant EMS. All Rights Reserved.